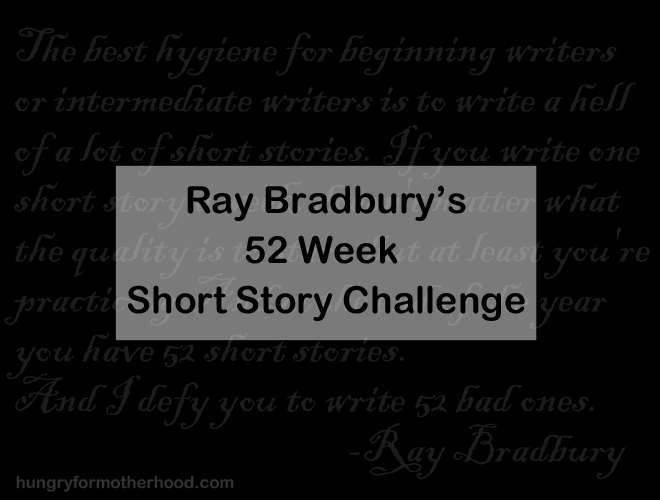 An indie author that I follow on Facebook just announced that she intends to do the 52 Week Short Story Challenge next year as issued by Ray Bradbury in 2001. Sounded like a good idea to me. But first, research. is to write a hell of a lot of short stories. but at least you’re practicing. And at the end of the year you have 52 short stories. He really does have a point. For over a year now, I’ve been writing these twice a week blog posts. Some are shorter, some are longer and some could even qualify as stories. But what I’m getting at is that I already have the habit built in. Writing twice a week has given me well over 52 cohesive pieces of something I can point at to say, “Yes, I write.” It’s natural to me to take the time to write on Sunday morning and Tuesday afternoons. All I have to do is add in one more thing. A short story that I can play with all week in between other obligations. And at the end of 2014, I will have 52 short stories. Bradbury claims they won’t all be bad. I can live with that. Additionally, he warns against beginning writers spending all their time on novels. Novels can take over a year to write. And in the end, the result might not be all it’s cracked up to be. Writing short stories gives you tons of practice without putting all your eggs in the novel basket. Then when you’re really ready to write a novel, you’ll have been working on your “writer hygiene” for long enough that you might actually be able to write something decent. If I kept up with a short story a week for a year, by the time next November rolled around, I think I would be better prepared for NaNoWriMo. Maybe the 2014 event will be the year I write something I’m really, really proud of. Though I have to say that I think most writers always think their work is lacking and are never really happy with it. At least that means we always try harder. Want to take the plunge with me? Tell me in the comments. My plan will be to blog about it once a month next year. Let’s compare notes. And if you’re not already a fan of Ray Bradbury,this should convince you to read one or two of his books. This video is not safe for work in case the name didn’t already make it clear. I’m doing this as my current New Years Resolution. Writing 52 stories is easy, I found that out fairly earlier into my year of writing. I was in week 20 when I hit #52. But that wasn’t the point of the challenge. It wasn’t “write 52 stories”. It was “write a story each week for a year”. And I think that’s the FAR more important part. Manage the whole task. Cope with the deadlines. Come up with a new idea each week. With 3 weeks left I’ve written 168 stories this year. My best year ever. Good luck to anyone taking it on. It’s not hard, but it’s not easy either.